She bloody well did it! Congratulations Miss Moonshine 2015, Miss Monique Sweet! If you’ve been following my blog lately (and thank you if you have!) you will have read this post about Miss Monique Sweet’s preparation for Miss Moonshine and this post wishing her good luck. Well it worked! Well – that and a little preparation and input from her of course!!!! Miss Monique Sweet is now Miss Moonshine 2015! Wahooooooo! Here she is in one of her winning ensembles (STUNNING watermelon custom skirt by Devel Men and Women and custom top by Honey L’Amour) with the gorgeous Miss Moonshine Judge, Ivy Fox – who you may or may not know, has been selected to compete in the prestigious Miss Viva Las Vegas Pinup Contest alongside Miss Victory Violet. Miss Monique Sweet deserves this title so much – and she has made away with some WONDERFUL prizes as well! Hopefully soon I will be able to do a little rundown on the whole ensemble development process – now that it’s not a big secret!!!! 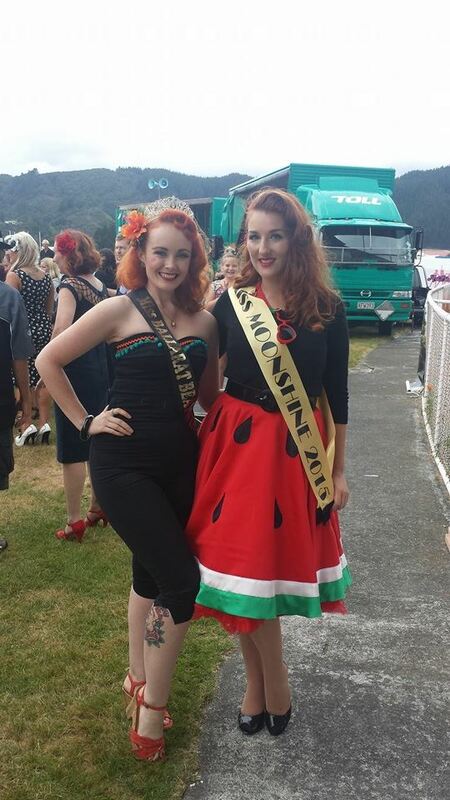 Posted on February 2, 2015 October 5, 2018 by MumptyStylePosted in Burlesque/Pinup, Fashion, Mumpty StoriesTagged Devel Men and Women, Honey L'Amour, Miss Monique Sweet, Miss Moonshine 2015, Monique Sweet, pinup, watermelon. Previous Previous post: Good luck Miss Monique Sweet!